…Swiss skier Reto Burgermeister, who has one of the coolest names I’ve ever seen, and that’s coming from someone with an unusual name myself. Burgermeister has reached the podium two times in his career: a 30km pursuit in Germany in 2004 and a 15km classic race in 2003, also in Germany. That’s a long career and lots of WC races. Without a doubt, 2003-2004 was his best season. The wiki author is kind of right that Burgermeister has had less success more recently, but I think “very unsuccessful” might be a bit harsh. His bad races certainly got really bad (>150 FIS points) and his top races declined from below 10 points to near 50. But Burgermeister was around 29 or so in 2004. Some skiers just continue hammering away past age 30, but many more do not. 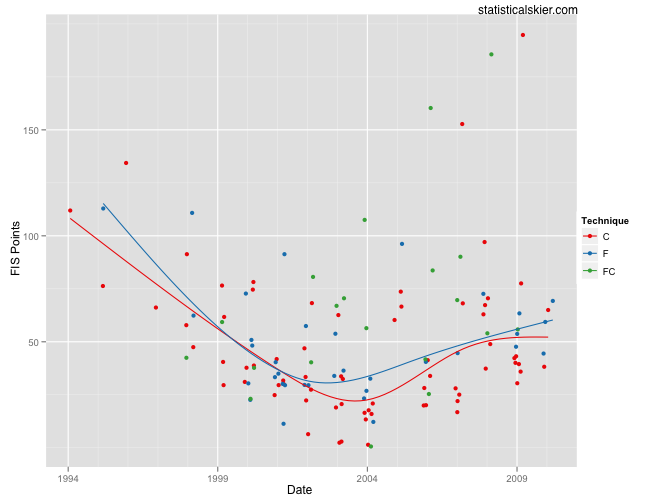 And his results at the end of his career aren’t really that different from his results from 1999-2000. Reto Burgermeister's distance results by technique. The trend lines suggest a (very) slight edge for classic, though I think that underplays the difference somewhat. Remember the trend lines track the average, but Burgermeister’s best races were nearly all classic, particularly later in his career. Reto Burgermeister's distance results by race length. 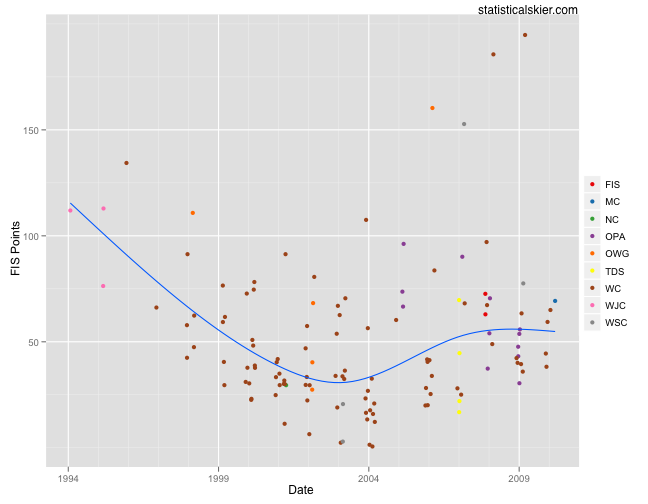 The best I can say here is that his best races, around 2003-2004, tended to come in 30k’s, but that’s about it. 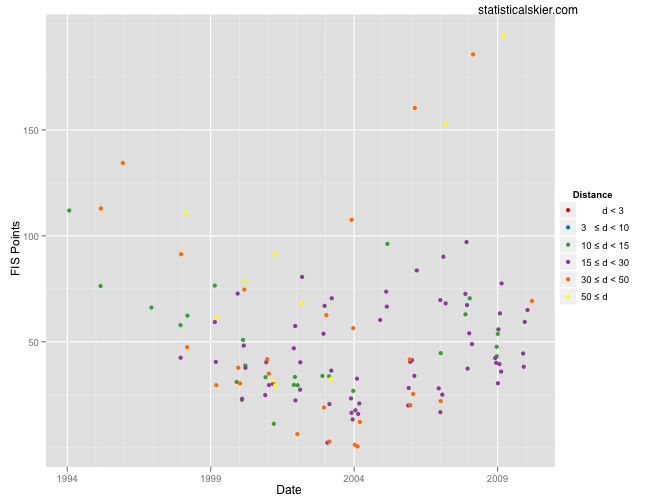 I’m going to forego the sprint results plots for Burgermeister, because, well, there are only 8 data points. And that would just make for a silly looking graph. So let’s just say that sprinting wasn’t Burgermeister’s cup of tea, and leave it at that. Posted by Joran on Friday, July 16, 2010, at 6:46 am. Filed under Career Retrospective. Tagged retirement, reto burgermeister, retrospective. Follow any responses to this post with its comments RSS feed. You can post a comment or trackback from your blog.